Marsha Collier has a prominent profile amongst eBay users, she’s an eBay powerseller, eBay University Lecturer and author. Martha is tireless in her promotion of the Dummies books and is keen to promote the UK editions. eBay.co.uk are planning a series of events and promotions for later this year (dates to be confirmed) and have asked Marsha to participate, which she’s very enthusiastic about doing. Dan Matthews is the online editor of Startups.co.uk and contributing editor of Growing Business Magazine. He is a regular user of eBay and has written several articles on staring an eBay business. Dan has written for a variety of publications including; businesseurope.com, where he was managing editor, venturedome.com and yourpeoplemanager.co.uk,. He is also a regular contributor to KPMG Performance Plus and Baker Tilly magazine and has written for the British Chambers of Commerce, Small Business Service (DTI), Business Link for London, Lloyds TSB, Yell and Forum of Private Business. Part I: Getting Serious About eBay.co.uk. Chapter 1: Using eBay.co.uk to Launch Your Business. 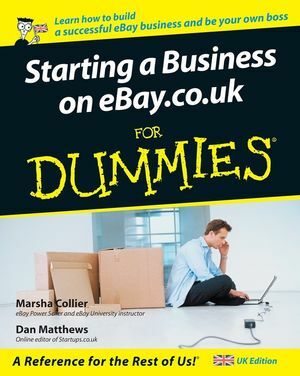 Chapter 2: eBay.co.uk Business Basics. Chapter 3: Essential eBay.co.uk Tools. Chapter 4: Practising Safe Selling. Chapter 5: Opening a Shop, Virtually. Part II: Setting Up Shop. Chapter 6: Stocking Your Shop. Chapter 7: Knowing Your Merchandise. Chapter 8: Establishing a Base: Your Web Site. Chapter 9: Software Built for Online Auctions. Chapter 10: Money and Sense: Budgeting and Marketing Your Auctions. Chapter 11: Jazzing Up Your Auctions. Chapter 12: Providing Excellent Customer Service. Chapter 14: Delivering on Your Promise. Part IV: Your eBay.co.uk Admin. Chapter 16: Practising Safe and Smart Record-Keeping. Chapter 17: Building an eBay.co.uk Back Office. Chapter 18: Ten Successful (and Happy) eBay Sellers and Their Stories. Chapter 19: Ten Strategies to Sell Your Stuff Successfully. Appendix B: The Hows and Whys of a Home Network.